HYSTERICAL! 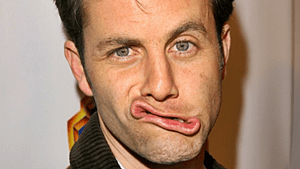 - Closet Case Kirk Cameron Knows How To Turn Boys To Men! Home/Featured/HYSTERICAL! – Closet Case Kirk Cameron Knows How To Turn Boys To Men! HYSTERICAL! – Closet Case Kirk Cameron Knows How To Turn Boys To Men! Failed 80’s teen heart-throb and closet case turned right-wing nut evangelist is hawking the below DVD set on his website. For the low price of $59.99 Kirk Cameron will show you how to turn a boy into a man. (And no, not in the bushes of Griffith Park. I wonder if the box set it contains an X marks the spot cruising map of Griffith Park? FOX New’s Megyn Kelly Asks FRC Hate Group Pres Tony Perkins About Why Gays Are So Intolerant?